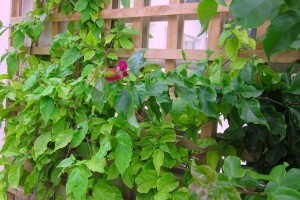 Home > Blog > Christine's garden > My Bougainvillea she flowers! Talk about a long wait! I bought two little bougainvillea plants just under a year ago and planted them. One has dark green leaves and the bright pink / crimoson flower bracts, the other has pale green leaves ands white flowers. They were both in flower when I bought them. Iplanted them and they prompty dropped all their flowers and stopped flowering. Then someone offered to make me a trellis to tie them to so that I could train them upwards against the wall and over our garage roof – which I gratefully accepted. When the trellis was put up against the wall we managed to tie one little branch - just the tip of it – to the new trellis, and I wondered how long I would have to look at the trellis before my Bougainvilleas covered it from view. I then dutifully watered my bougainvilleas. Every day. I fertilised them. Often. They grew. And they grew, and they grew. But they never flowered. Not even once, slightly in almost a year. The trellis is almost no longer visible – in under a year they have grown a LOT! And then I started buying gardening books and read up about bougainvilleas. Aaaah … big rookie mistake – all the watering and patient fertilising resulted in prolific growth and no flowers. According to all my books and internet searches, I’ve discovered that … “These plants flower best under stress. Keep the plant slightly on the dry side. Water thoroughly, then allow to become moderately dry between waterings. They respond extremely well to stress, such as drought and heat, and reward you with excellent bloom”. So I stopped “caring” for them, ignored them completely and my reward? I think that Bougainvillea are the most forgiving plant. We also had a small one in a pot in the back garden and we moved it all the time and hardly watered it and it kept giving us a beautiful crimson bushy hair-do. I think the final move was the last straw – it eventually wilted. I felt so bad!